What is there to do in Cornwall? – Travel. Live. Eat. What is there to do in Koh Samui? What are the things you can do in Rome, Italy? What to pack with you to Cornwall? What is there to do in Cornwall? What Is Germany Like In Winter? Travel Essentials: things you don’t really think about! What will happen to you as you travel? 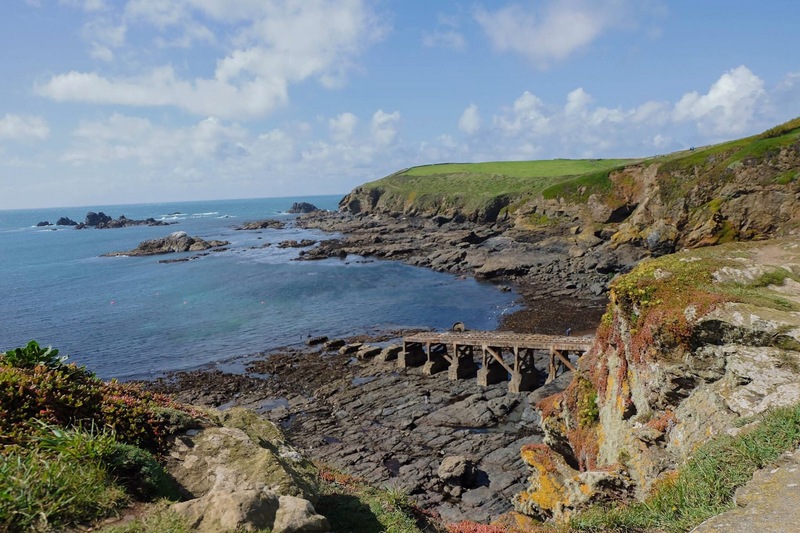 September 18, 2017 September 18, 2017 travel live eatLeave a Comment on What is there to do in Cornwall? 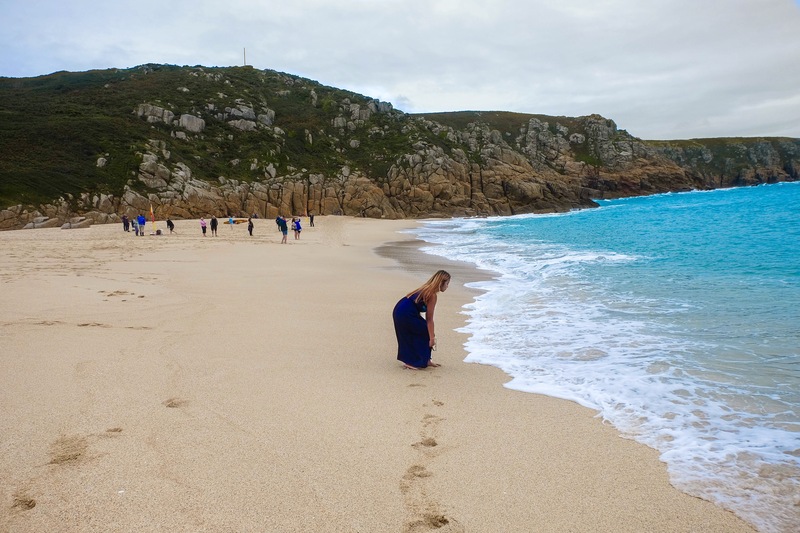 The county of Cornwall has a great mixture of beautiful beaches, coastal and many more natural attractions. What I’ve discovered from a 5 day trip around Cornwall or any trips in general is that no matter how long you spend in each region, it is hard to explore every single corner of it. 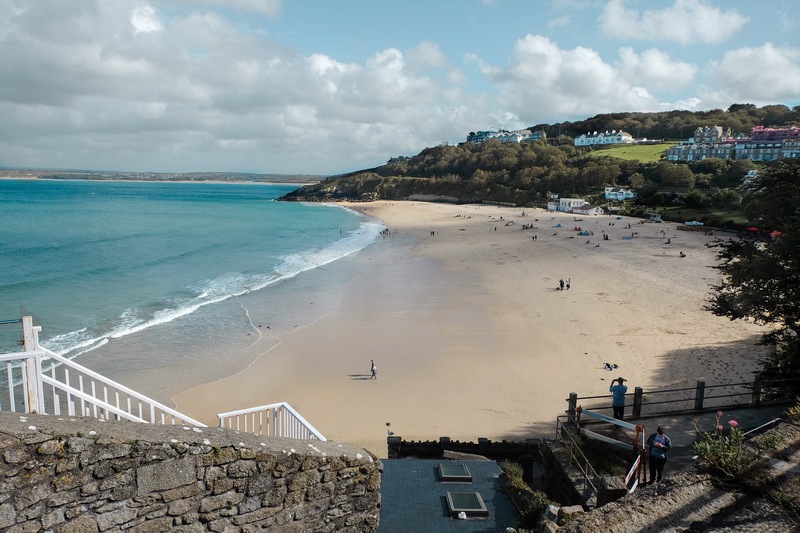 It’s difficult to pin down to only couple things to do in such a gorgeous county but here are the things you can do to fill up your Cornwall itinerary. PS. Recommend going there during sunny days… even then don’t forget to wear a waterproof jacket and sneakers! Helston is usually the first stop in Cornwall after Newquay, Truro and Falmouth area. It is 30 minute coach ride away from Falmouth (£5.1). 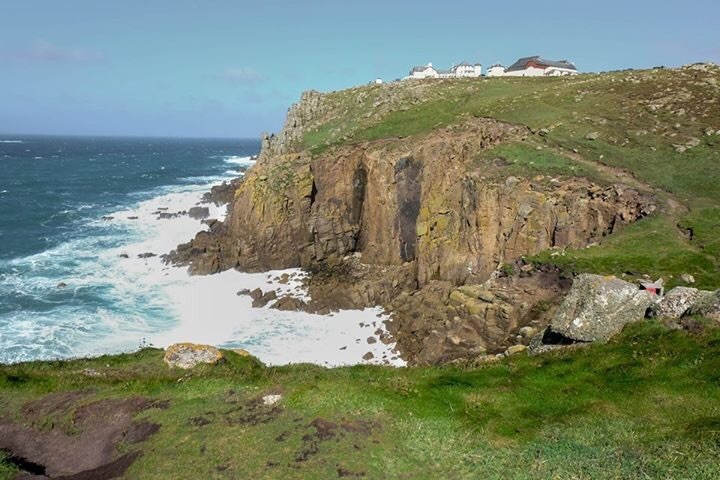 The Lizard’s point is known at the most southerly point of Britain, it is also where the Atlantic meets the English Channel. To avoid the crowd you should get there anytime before 10 am, it’s literally dead quiet and you get the whole place for yourself. Warning: There is a high possibility of you getting a 2 minute rain every hour, even though the place is gorgeous we’re still in the UK which means rain is your literal friend. Kyance Cove is about 45 minute hike away from the Lizard’s Point. People hike there all the time as it’s less than an hour away, there is even a hike trail that leads to Kyance Cove. However, due to a little circumstance that I encountered it was impossible for me to capture a photo of the path that leads to Kyance Cove or Kyance Cove itselfto show you. 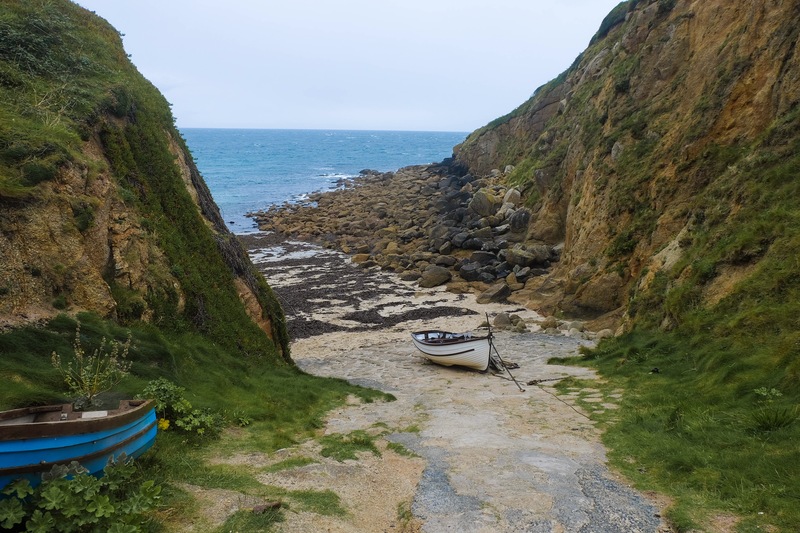 One thing you can definitely expect from this spot is a beautiful sight filled with Cornish coastal and blue water. It’s absolutely gorgeous! 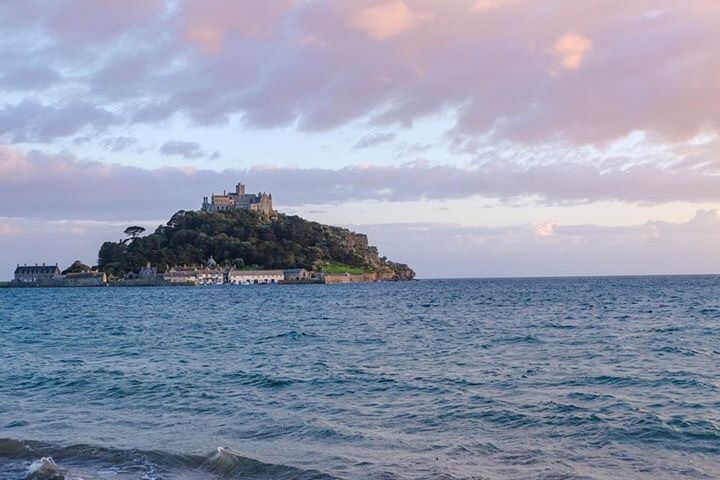 St. Michael’s Mount is one of the most famous attractions in Penzance, mostly because of how close it to to the town centre (15 minutes by bus or 1 hour and 45 minutes walk). The place is famous for its causeway that appears when the tide is low, usually between 1-2 pm. You can actually walk from the Marazion beach to the mount. However, if you can’t make it during the low tide there is always a ferry that can take you there for approximately £5 per ride. Totally recommend seeing the sight by the beach close to the sunset time because the sky has such a beautiful color of pink and sunset orange on top of each other and it’s abs outlet breathtaking! Cornwall’s most famous theatre that provides great theatre performances with a gorgeous open-air by the ocean environment (and sometimes sunset by the ocean if the performance is available around the time). It’s absolutely breathtaking but you can only enter the place if there are no shows playing, which happens only couple hours a day because the theatre gets really busy during summer time. 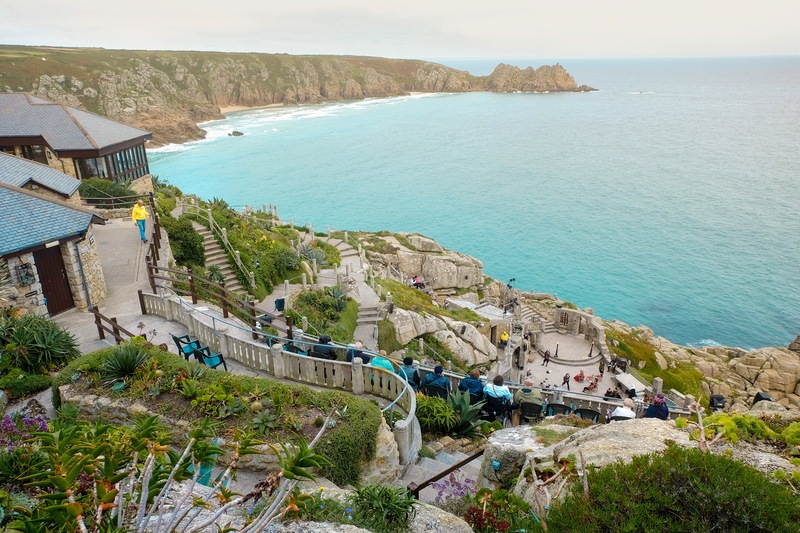 However, if you don’t get a chance to enter the place, there’s a view near the car park where can briefly see the sight of Minack Theatre from above for £1. This is a beach that seriously looks like it’s coming off of a fairytale story: firstly, it doesn’t look like a place you would find in the UK, and secondly the water is incredibly blue which makes the sight even more gorgeous than before. 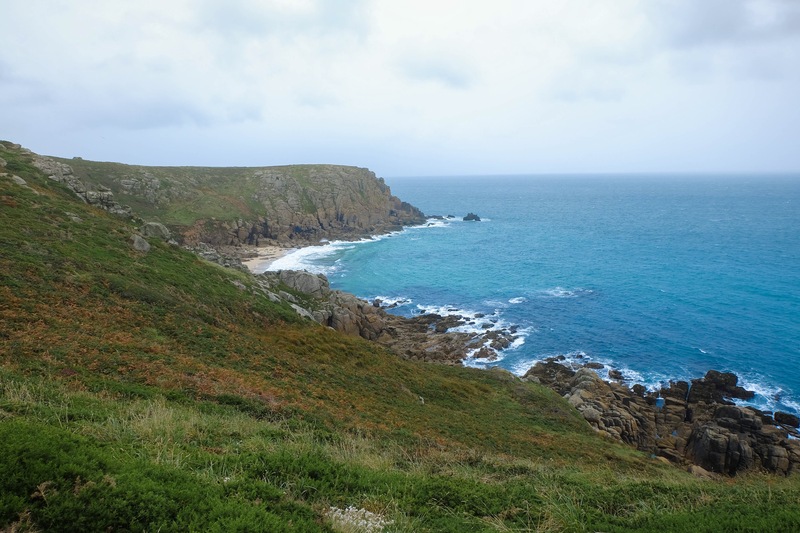 It locates right beside Minack Theatre. Near the entrance, you will see a split path with the sign saying Portcurno beach, this will lead you to a hilly trail down to the beach. Even though the water invites you to go for a swim, don’t listen to it because you would end up freezing yourself because the water is absolutely freezing. What you can do though is to spend some time there listening to the waves and enjoy the lovely sight nature has provided you in Southern part of England. Next stop is near Land’s End (15 minutes away by bus), it’s such a beautiful spot. The sight of it that you see when you’re taking a bus to Land’s End is just way too lovely to not find out what the place is called and which bus stop it is to get there. This place is called Sennen Cove, it’s definitely the second spot I highly recommend after Porthcurno beach. This time you can actually enjoy your food from a restaurant’s or cafe’s balcony while looking out into the lovely view of this place, unlike Porthcurno that has no cafes by the beach whatsoever. Although people only suggest Land’s End as it the end land of the UK but lately it’s become so commercialised that it’s hard to find much natural beauty from it (it literally has a setting similar to what you would find at Universal Studios including gift shops and razor houses), that is the reason why I don’t put Land’s End on the list because Cornwall is mostly known for its natural beauty rather than commercialised things like a mini amusement park by the coast. 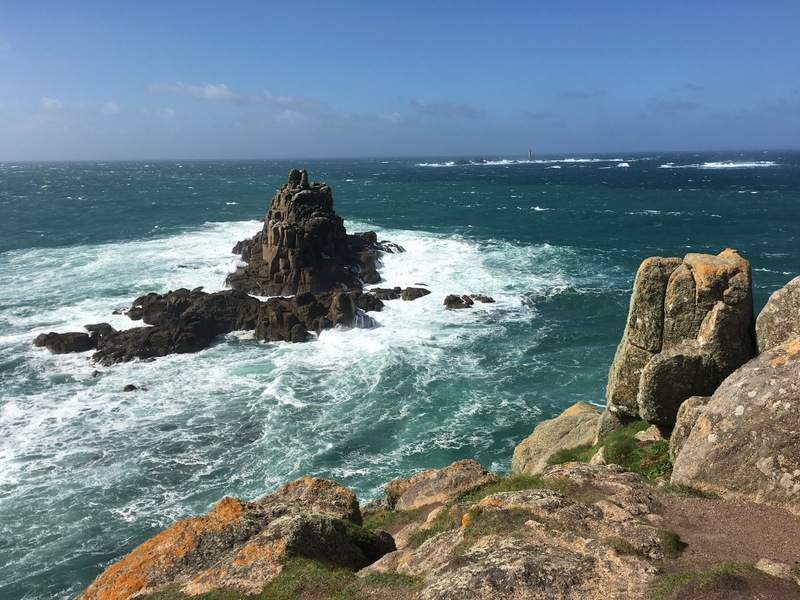 Regarding the last number, there is one thing you can do still to enjoy the sight of Land’s End… it is to do a coastal walk from Minack Theatre to Land’s End or Land’s End to Minack Theatre. Don’t worry if you think you’re going to end up being the only one doing the walk because you won’t. There is a trail created specifically for this purpose as there’s so many people who have done it. If the rain doesn’t hit the coast then it is glorious to spend 2 and a half hour walking and enjoying the nature of the surrounding. 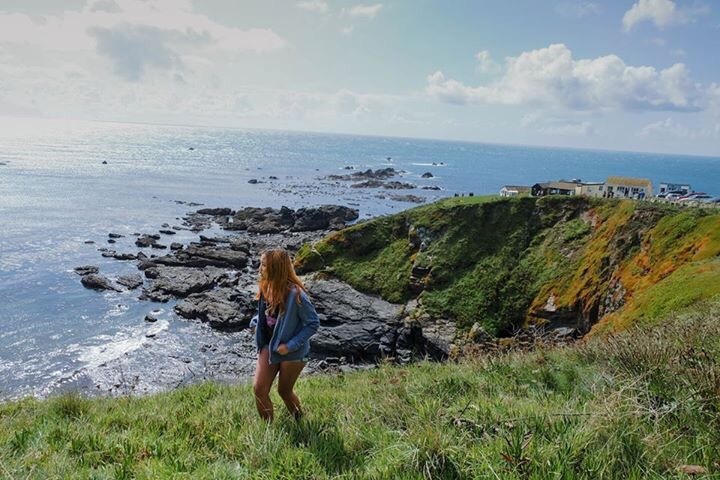 This town is the closest to my heart because it is a paradise for people who love a stunning blue water where they can go for a surf and live in England. They’ve got so many stores in town that let you rent wetsuits and surfing boards, there’s even a surfing school that teaches people from all skills (from a complete beginner). Not only just saying that its beach is beautiful, their food is amazing absolutely everywhere. I’ve been to St. Ives twice and tried 5 different restaurants and I’ve never been disappointed with the food even for once. Even though people say there’s too many tourists but it’s such a nice place to spend your summer there, can’t really blame the people! It’s also really convenient since the beach is 5 minute walk away from the town centre so you can easily buy yourself some food and have a nice picnic by the beach… or grab yourself some delicious snacks at the cafes!